The Cottesloe Powerback Swimsuit is an essential swimsuit, designed with comfort and fit in mind. This swimsuit features a flattering shelf bra, and is manufactured from resistant, yet flexible, Aqualast fabric. Manufactured from Aqualast™ fabric: For a perfect shape and fit, Zoggs Aqualast fabric is 100% chlorine and UV resistant and allows absolute freedom of movement. Exceptional elasticity along with fantastic shape retention means greater comfort and support. 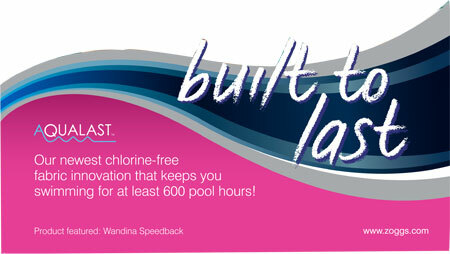 Aqualast is easy to maintain, quick drying and lasts at least 600 pool hours. Look out for tummy control, this will smooth and support the tummy area. Detail on the bust will focus attention away from the tummy whilst an empire line will enhance the narrowest area of your waist. Vertical details lengthen the body and provide a slimming effect. Aim to have the detail, colour and design focusing on the chest and away from the hips. Achieve a slimmer look – opt for control fabrics with draped and ruched styling. Asymmetric details will avoid a focus on unwanted areas. Be bold and flaunt those curves! Enhance your shape with added features such as cup support and control panels. An empire line will further enhance your natural shape. Details on the waist will create the illusion of curves. Enhance your shape with added features such as padded cups and control panels. Look out for bold colours and prints, you can get away with it so go for it! Aim to have the detail on the lower half focusing attention away from the chest. Embrace your assets with sweetheart necklines. Look for suits with hidden support features such as cupsized, underwired and shelf bras. Zoggs Women's Cottesloe Powerback Swimsuit is rated 4.4 out of 5 by 132. Rated 5 out of 5 by Bunnyllama from Good fit, well made Comfortable and hard wearing. No signs of chlorine damage after several months of use. Rated 5 out of 5 by Wiggleswimwearfan from Excellent, hard wearing This swimsuit has lasted for a long time - being used regularly in a chlorinated pool. It has until just recently kept its shape and has been very comfortable to wear. I do find any powerback design awkward to get into but once on the straps do not slip and don’t hamper movement either. I bought this as a sale item and have been very pleased with it - I hope my replacement choice (Wiggle sale item) is just as good! Rated 4 out of 5 by JRS2015 from Comfortable swimsuit but go up a size This is a good swimsuit for the price but I had to go up a size for a good fit. Comfortable to swim in - I swim about three times a week. Is there a front lining? I am just over 5'8&quot; and 63kg and was wondering if anyone with similar height/weight has purchased the Zoggs Cottesloe swimmer? I was thinking a 36 would do. PS I am more of a lamp post shape than hourglass (unfortunately)! Hi would you still have the BLACK colour for the item? Thanks! I can confirm that we still have some stock of the black colourway in sizes 36&quot; to 40&quot;. I hope this helps. The 34&quot; should fit I think.